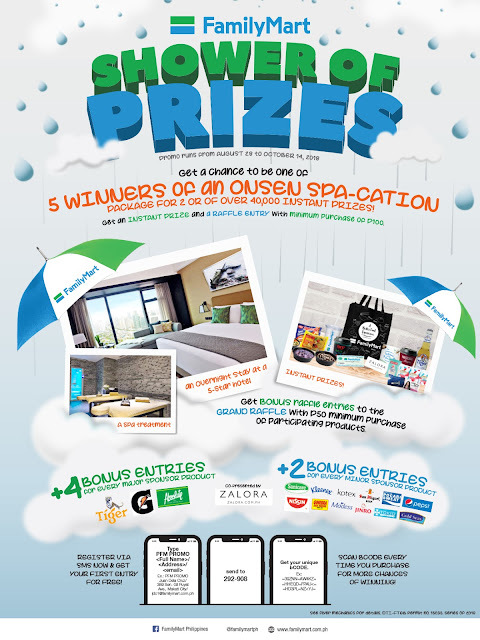 Blow your rainy-day blues away by joining FamilyMart’s Shower of Prizes Promo! With every purchase at FamilyMart, you get a chance to win a staycation for two, spa treatments, and over 40,000 instant prizes until October 14, 2018. All you have to do is make a minimum purchase of P100 in a single receipt at any FamilyMart branch, and you already get one raffle entry and one instant prize pick! Instant prizes include FamilyMart-branded coffee mugs, tumblers, umbrellas, and eco bags, as well as Zalora gift certificates and a wealth of other rainy-day essentials. All entries will be downloaded, and an electronic raffle system will be used to pick the five lucky grand prize winners who will each receive a relaxing Onsen Spa-cation package for two during the Grand Raffle Draw on Friday, October 19, 2018. To join this exciting promo, customers must register for free via mobile by typing PFM PROMO along with your name, complete address, and email and send to 292-908. A unique bCODE will be sent to your number, which you’ll have to scan at the counter every time you make a purchase. Those who previously registered for the Summer and Cool School Promos do not need to register again. No matter what season it is, you’ll surely find the best deals and essentials at any FamilyMart store near you! For updates, exciting products, and awesome deals, like and follow FamilyMart Philippines on Facebook, @familymartph on Instagram, and @FamilyMartPH on Twitter.